A collaborative effort between Conservation Northwest and local ranchers, the Range Rider Pilot Project seeks to demonstrate the effectiveness of non-lethal measures in deterring or reducing conflicts where wolves and livestock overlap in Washington state. We also coordinate with the Washington Department of Fish and Wildlife (WDFW), independent wolf experts, scientists and other partners to support range riding efforts. This collaborative work is reducing the potential for wolf-livestock conflict, and by extension is protecting wolves from incidents that can quickly become lethal for both predator and prey. The project season typically begins with trainings in April and a field season from May through October. We also offer workshops, ongoing training opportunities, and technical and field support. 2018 was the eighth year the project has operated, with between one and seven project seasons completed each year. A “project season” is one full season with a range rider working from spring turnout (typically early May) through fall roundup (typically October). The number of project seasons per year varies depending on how many ranchers we partner with, and how many range rider positions we co-sponsor. Note: The Range Rider Pilot Project began in 2011, working with ranchers in northeast Washington. The program has since expanded to targeted areas across Eastern Washington where wolf packs and large ranches overlap. Due to website changes, season updates from 2014 and prior are no longer hosted online. Contact us for more information. read more about our Range Rider Pilot Project in articles from The Seattle Times, High Country News. Yakima Herald and Wenatchee World. Wolves typically hunt by testing, or pushing, a herd of animals to run, and then singling out the weakest, youngest, or oldest animals to kill. As one Alberta rancher put it, “If a calf or yearling runs when pressed by a wolf pack, they die.” Yet recent efforts by groups of ranchers in places like Alberta, Montana and Idaho show a solution. Having a human, especially one on horseback, in and around a rancher’s cattle for the entire grazing season can lower wolf-cattle incidents. It helps calm cattle and disrupts wolves’ hunting patterns. This practice is called “range riding”. From May into October, the project’s range riders work in northeast Washington, the North Cascades, including the Methow and Teanaway Valleys, and the Colville Confederated Tribes Reservation in north-central Washington. Ranchers employ their own range riders, often with experience working with horse and cattle from local communities. Range riding is a herd-supervision method, something that was once the norm for ranchers and cowboys, but was not consistently practiced after top predators were eradicated from western landscapes. We’re working to help ranchers bring back range riding, as well as utilizing other conflict-avoidance methods such as carcass composting, fladry (bright flagging typically hung around calving pastures, often with electrified fencing), guard dogs and special animal-husbandry techniques. While herd supervision is effective at deterring conflicts with predators, we don’t expect it to always be 100-percent successful. And we empathize that it’s an additional challenge with additional expenses for ranchers whose line of work is already tough as it is. We’re partnering with ranchers to provide information, training and cost-sharing support. The goal of the Range Rider Pilot Program is to help them successfully coexist with predators back on the landscape. Along the way, we’re reducing conflicts with wolves and building tolerance for their recovery. Want to support this important project? Please make a donation today! Between gas, supplies and pay for a skilled employee, a thorough range rider can cost ranchers as much as $20,000 per grazing season. 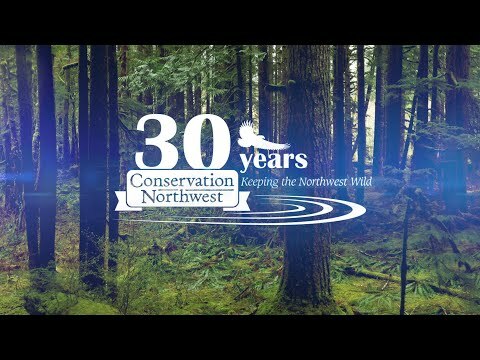 But livestock producers who enter into our program can receive up to $10,000 in funding from Conservation Northwest, as well as matching grants from the WDFW through a separate state program—enough to nearly or completely cover their seasonal range-riding expenses. State contributions come in part from a legislature-approved program that uses vanity license-plate sales to fund the implementation of predator-conflict avoidance efforts. Patrolling on horseback, ATV and even mountain bike, these modern cowboys and cowgirls worked from spring turn-out until the cows came home in the fall, covering thousands of miles over the course of the season to provide a significant human presence and make sure the cattle stayed calm, healthy and kept away from wolves, the location of whom is often provided confidentially by WDFW through collar data.